Good to know, thanks, Rick! I managed to miss out on that particular childhood craft, and my first encounters with the practice were other candle snobs who felt using crayons was akin to trying to built an a-bomb in your back yard. 😉 I’ll have to try it in the future (maybe with some scent to cover the eau-de-Crayola!). This is a wonderful post! 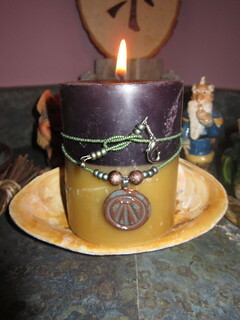 I love how you are mixing in ashes from ECG and reusing so many old candles. Where do you get the candle supplies? Do you have any recommendations? Thank you! I picked up most of my starter supplies (wicks, dyes, moulds, paraffin—before I became a snob 😉 ) at Michael’s Arts and Crafts (not sure if you have those out by you?). 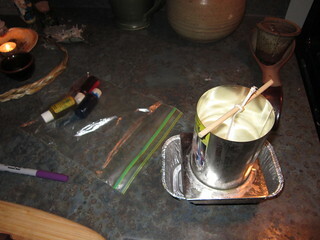 Melting pots came from thrift stores, and smooth tin cans can make decent starter moulds. 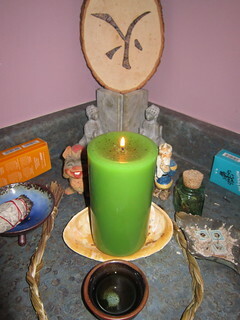 The beeswax came from eBeeHoney.com, located in Ohio. When I ordered 10 lbs from them going on 6 years ago, they had the best prices on the internet, but I don’t know how well they compare now. 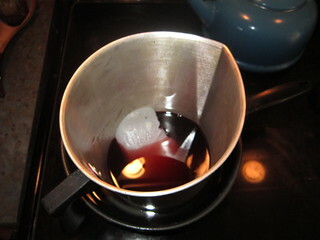 Ideally, one of my neighbors has taken up bee keeping, so I’d like to be able to get wax from her once her colonies are well enough established (yay, local sourcing!). I can get beeswax locally, yes. Yes, we have Michaels and also Hobby Lobby around, I’m sure some of them will carry the supplies :). Most excellent! I love articles like this: bit of how-to, bit of crafty goodness, bit of magic all at once 🙂 October is my most crafty time of year, so now you’ve got me wishing I had time to make candles of my own. Sadly, no time. I’ll stick to decorating wreathes and such instead. Thanks very much, glad you enjoyed it. 🙂 Wreath-making is one of those things I always want to try, and then I remember my mother’s bloody hands after making holly wreaths each year (and refusing to wear gloves, sigh), and I manage to put it off for another year. 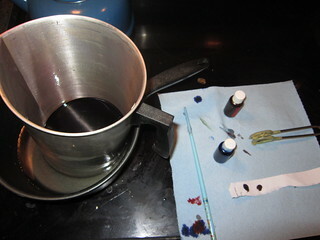 ;p May your own crafting go smoothly! Thanks, Noni! 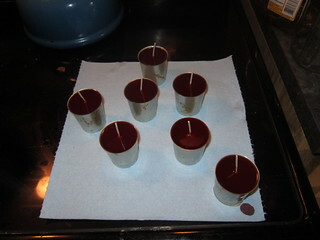 The TS votives have been burning nicely the past few weeks. 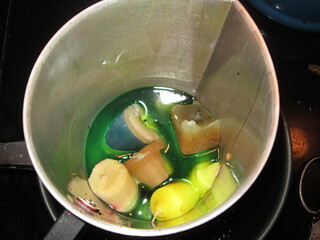 I think if you left the crayola wax chunky, put it into the mould first, then poured a melted tinted wax around it, it could come out nicely. I’d love to see pics if you try it! 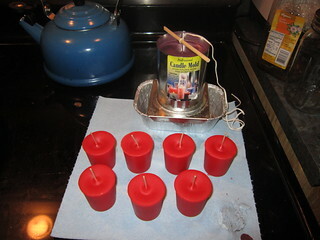 This stirs up fond memories of making candles with friends years ago. 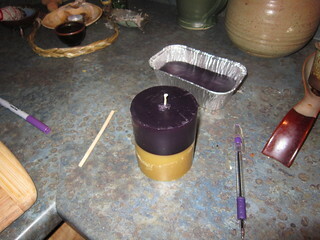 I do have saved up pieces, so I have to make some candles soon. Thanks for the tips! You’re most welcome. 🙂 Glad you found it useful!